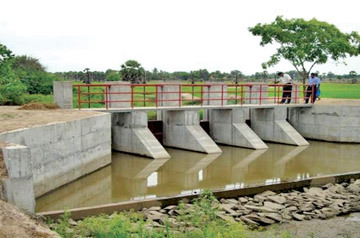 The fast-developing Batticaloa district is different from any other district in the country with its vast lagoons, thousands of acres of paddy fields, lush vegetation, coconut and palmyrah groves and marshlands, proving to be a pleasant sight for anyone. 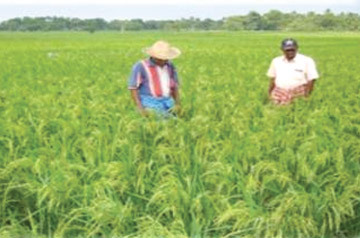 It is now the paddy harvesting season in the district which is dubbed as the 'Granary of the Country' and contributes to about eight percent of the total paddy production of the island. 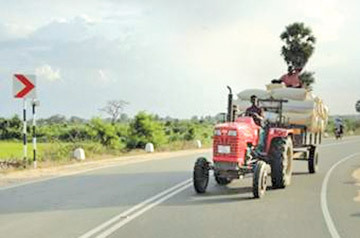 With the harvesting of paddy in progress, the sight of the combined harvesters in full throttle, farmers busy loading their harvested paddy into trucks and tractors and herds of cattle grazing in the harvested paddy lands are common all along the highways and rural roads in the district. While the construction of the Manmunai bridge is in progress at a cost of Rs. 1,600 million, the sight of hundreds of people waiting, many with their motor cycles and trishaws, to board the motor-powered ferry and another ferry already in the middle of the Manmunai lagoon carrying people and their vehicles to the other bank, are enchanting sights. Elders waiting to board the ferry told the Sunday Observer that the ferry service to take people across the lagoon to its western side, where most of the paddy lands, small townships and schools are located, has been in operation for over four decades. The hazardous ferry service was operated by pulling ropes tied to the ferry from the banks and the anticipated opening of the Manmunai bridge shortly will put an end to the saga of the 'ferry boat crossing'. On a visit to the vast prawn culture areas in Kokkadicholai and Mahiladitivu, en route to Kaluwanchikudy from Batticaloa, we came across some damaged and deserted houses and buildings in Ambilanthurai, Kokkadicholai and Pandariyaveli where the LTTE terrorists had some of their camps, bases, hideouts, ' Maveerar Thuyilum Illam' (the place of slumber of cadre), the 'Cholayagam' office complexes and bottlenecks of 'no man's areas', which were reminders of the bitter terror regime and the untold suffering, hardship and threats faced by the people of the district. At the Batticaloa Secretariat, the Government Agent, P.S.M. Charles, who had recently won an award from an international women's organisation, told the Sunday Observer that under her own initiative, she had provided livelihood assistance to women who had been widowed as a result of terrorism. The program of supplying traditional food items such as string hoppers, pittu, dosai and iddly was started with 14 women and the number of women benefited under the program is about 50 at the moment. These food items have a very good market and are selling like hot cakes, bringing each of the women a monthly income of around Rs. 25,000, she said. The program is now managed by the Kaviya Women's Development Organisation. Under the Deyata Kirula program, the district was allocated Rs.1,600 million while other allocations from the Government were around Rs. 1,400 million up to the end of 2013. The beautification of the city, the renovation of the Dutch Fort, where the Secretariat is located, and the renovation of road networks were undertaken with these fund allocations. More fund allocations are expected in the current year too, she said. 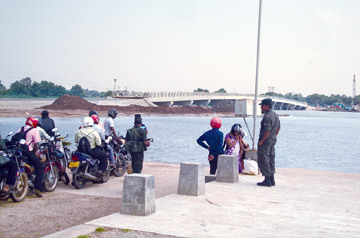 Under the Negenahira Navodaya (Reawakening of the East) program, many mega infrastructure development projects, including the construction of roads and bridges and common buildings, including six new DS office buildings in the once LTTE-occupied Western part of the district, and livelihood facilities to the nearly 37,000 displaced families were undertaken, she said. With the assistance extended for the promotion of agriculture and fisheries, the construction or renovation of buildings and shelters, educational development and assistance for livelihood activities, the district has now transformed in to a model district, with communal amity, democracy and happiness restored everywhere, Charles said. 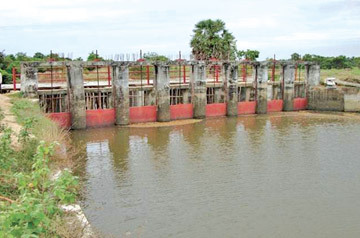 The Batticaloa district occupies the central part of the Eastern Province. It covers a land area of 2,633.1 square Km; the district accounts for 3.8 percent of the country's total land area. The physical features are flat land not exceeding 7.62 metres in height above sea level. It consists of undulating plains and alluvial flats, watered by rivers from the mountain zones of the Uva and Central Provinces. The east coast of the district comprises sandy soil while the west is clay soil. The land boarding the lagoon is alluvial soil. The Batticaloa district is divided into 14 Divisional Secretariat Divisions which comprise 345 Grama Niladhari Divisions and 965 villages. Within the district are a number of natural resources that contribute to its socio-economic development. The Batticaloa lagoon is a significant natural resource which traverses through 73.5 Km from Verugal (North) to the Batticaloa town and also extends a further 35.2 Km from the Batticaloa town to Thuraineelavanai (South). 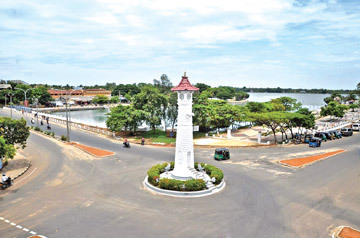 The Batticaloa district has an estimated population of 598,265. The density of population is 227 people per square kilometre. The highest density of population is at Kattankudy DS Division and the lowest at Koralaipattu North DS Division. The population distribution by gender is male - 285,347 and female - 301,053. This district has all ethnic groups - Tamils, Muslims and Sinhalese as 72 percent, 27 percent and one percent respectively. The total amount of funds spent between 2009 and 2013 is Rs. 5,887.37 million and a major portion (58 percent) was spent on roads and bridges while 26 percent was on providing shelter. Thirty two percent of the population from six DS Divisions (163 Grama Niladhari Divisions) were displaced from 2006 to 2007. All displaced persons were resettled in their own land in 2009. The number of families resettled was 36,911. Temporary or semi-permanent houses were provided to all resettled families (through NHDA, UN and INGOs). WASH facilities were upgraded by UNICEF, Local Authorities and health agencies. Livelihood assistance was provided by the Government, UN agencies and INGOs (around 55 agencies supported the livelihood programs). All infrastructure facilities are ensured by Government programs and other funding arrangements. Site clearing, demining and transport services are supported by the Security Forces. The road network up to a length of 936 Km has been rehabilitated while 33 small and medium-sized bridges have been reconstructed. In areas which had limited access in the past after the era of terrorism, the construction of new bridges and roads has connected villages to the main cities, eg. 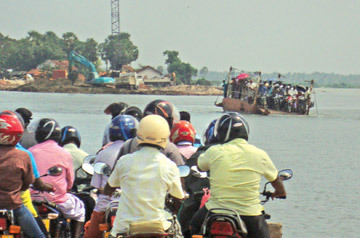 Chenkalady - Karadiyanaru, Batticaloa - Kokkodicholai and Oddamavady - Vakarai. extent of land under cultivation has increased from 60 percent to 98 percent. 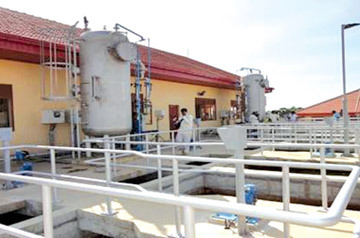 Production has doubled (59,227Mt - 102,366Mt), capacity of recharging groundwater has increased and the capability of victims' response to floods has increased through the empowerment of the Government and community institutions. A fisheries harbour has been reconstructed, 127 landing sites established, 40 multi-day boats distributed among the fisher-folk, a fisheries training centre has been reconstructed and four coolers have been provided to fisheries societies. Much progress has been achieved in the areas of fisheries, dairy farming, education, IT training and the provision of shelter.